The United States has not supplied South Africa with military equipment under the table for nothing. American capitalism has a fortune invested in South Africa which has to be protected from the black population, and to ensure this, South Africa’s racist regime needed the arms of the U.S. and its allies. Today, thanks to this aid, South Africa is largely self-sufficient in weapons production. The United States is South Africa’s number one trading partner, the annual exchange coming to about $2 billion. American bank loans to South African companies, and to the government itself, amount to about $2 billion as well. 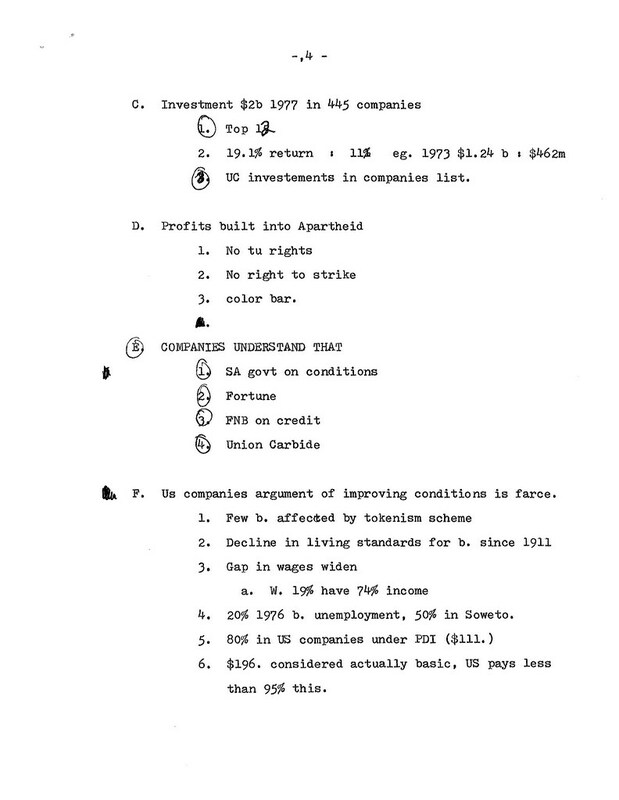 And American corporate investment in South Africa in 1977 is approaching the $2 billion mark. You can now see why Carter refuses to take economic sanction against South Africa. average for American business of 11%. The profit rate is high because black South African workers have no legal means to fight for wages, working conditions or better jobs. They are barred by from striking, limited by law to the lowest jobs, and countless other laws prevent any sort of legal organization. Because of these conditions, black wages are extremely low and the corporations pick up the difference in their profits. Of course, if you ask an American capitalist about all of this, he will tell you how much he hates apartheid, and will piously express sympathy for the human rights of black South African workers. You will be told that American capitalism is the way to create change in South Africa, and that conditions in American companies operating in South Africa are good for black workers. The figures prove otherwise. For example, General Electric of South Africa (a familiar company to us) pays unskilled while workers $186./mo. while paying its black workers in the unskilled level $73./mo. Union Carbide pays its white workers a minimum of S142./mo., while the minimum for blacks is $48./mo. (1972 figures). These statements are not exceptions. 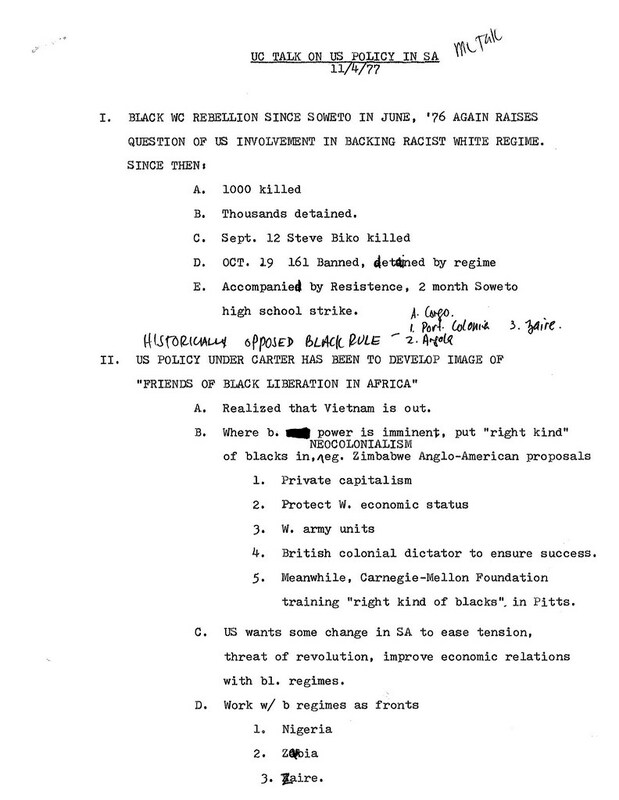 Virtually every black South African involved in the struggle against the regime opposes American investments in South Africa. American corporations have remained in South Africa despite the misery exacted from its black population because, under capitalism at least, profit is quite at home with brutal oppression. The University claims that it doesn’t invest on “political grounds.” But making a good profit off of the misery of black South African workers is political — it`s the politics of capitalism. Supporters of black liberation in South Africa aren’t in a position to join our sisters and brothers in the streets of Soweto. We are in a position, however, to aid their struggle by demanding that the United States end all forms of its military, political and economic imperialism in South Africa by getting out now. We can begin at UC. Letwìn is a member of the International Socialist Oŕganization. We were rather appalled at the incomplete report on the meeting on “South Africa Repression and U.S. Response” held on Nov. 4th in TUC. While you made brief (and questionable) mention of John Mutambara’s description of the history of South Africa, you didn’t touch at all on the other aspects of the meeting, those which affect us most of all: American support for the racist South African regime. 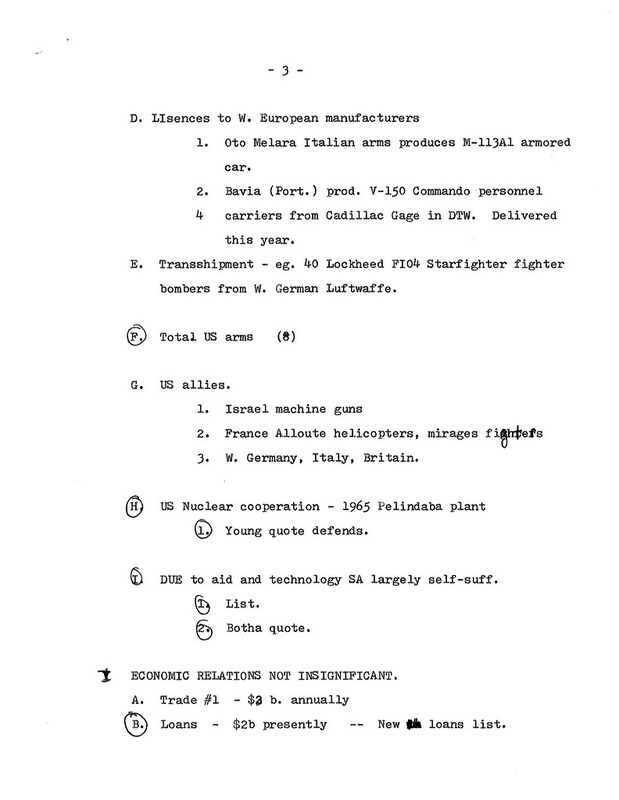 Not only has the U.S. supplied South Africa with a wide range of military equipment, but this material was supplied during what was supposed to have been a “voluntary” arms embargo on South Africa since 1963. Most relevant, however, to those of us at the University of Cincinnati is the $10 million that UC has invested in companies operating in South Africa. In response, the meeting on Nov. 4 kicked off a petition drive demanding that UC rid itself of all investments in these companies who play a key role in bolstering the South African racist regime. We ask all to support the petition drive, and we also ask that the News Record find the space to deal with this key issue. The Carter/Young promise of support for a six-month UN arms embargo against South Africa announced Oct. 27th is a farce. 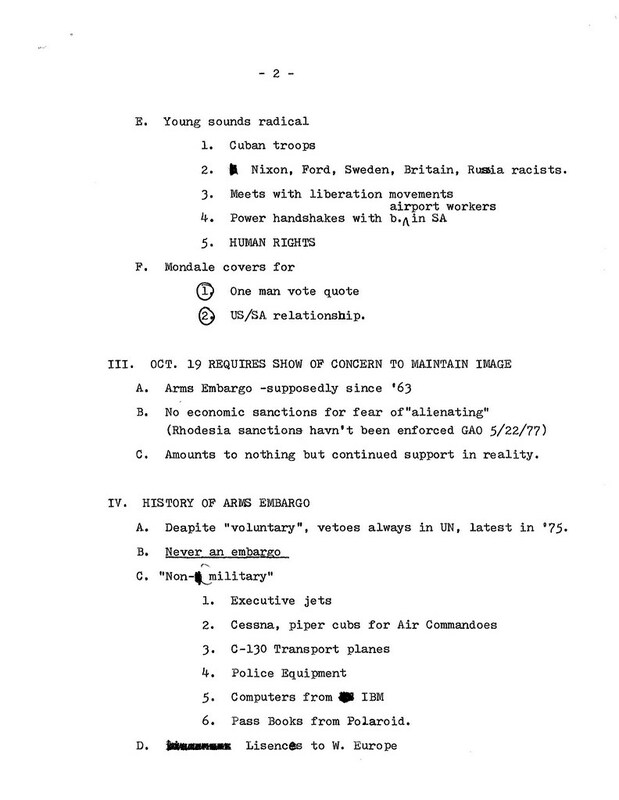 The US claims it had a “voluntary” arms embargo on the white racist regime since 1963. However the US has vetoed proposed UN arms embargoes numerous times, most recently in 1975. Most important, however, is that there has never been a real American arms embargo on South Africa. 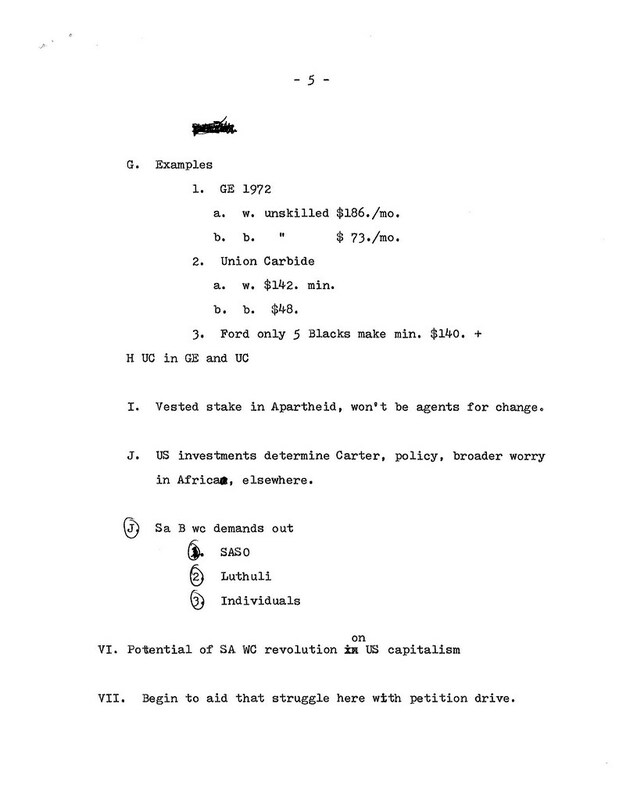 Through a series of tricks, the US government has devised means to get arms to the racist regime. The most obvious example of American support for the South African regime has been supplying military equipment while pretending that it’s not military at all. In addition, the US allows the sale of civilian Cessna and Piper Cub light aircraft which form the backbone of the South Afrìcan government’s “Air Commandos,” a component of the vast volunteer military forces designed to be used for reconnaissance in cooperation with ground forces in repressing black uprìsings. One military expert put it this way — “Without these aircraft, the helicopter, Cessna and Dakota, problems of supplies and communications would be insurmountable. American police equipment is also termed “non­military” by the US government, and as a result, the South African police are equipped with some of the most advanced “crowd control” equipment in the world. This equipment has played a key role in the murder of thousands of black South Africans in the past few years. Most significantly, the US provides heavy military equipment to South Africa by selling licenses to Western European allies to produce military equipment, who in turn provide it directly to South Africa. For example, the Ford Motor Company has licensed Oto Melara, a major Italian arms manufacturer, to produce a version of the M-113A1 armed personnel» carrier, which is then sold to South Africa. Meanwhile, Bavia, a Portuguese firm, is producing the Commando personnel carrier under license from Cadillac Gage of Detroit. The Commandos, like other US weapons produced under license, were in the process of being delivered to South Africa earlier this year. No attempt has been made to stop them. American arms reach South Africa through secret “transshipment,” which simply means addressing arms to one country which then secretly ships them to South Africa or Rhodesia. There is almost no way to keep track of such practices because of the tight security surrounding all military equipment. The South African Air Force has 40 Lockheed Starfighter fighter/bombers provided by the US through the West German Air Force. Israeli arms also are provided in massive amounts, and these are built with technology gained from the US through NATO, and other military arrangements.